The R.L. Winston Rod Company, along with Bauer Fly Reels, have announced the welcome of Chris Seipio as the Western Canada Sales Representative for the two companies. The R.L. 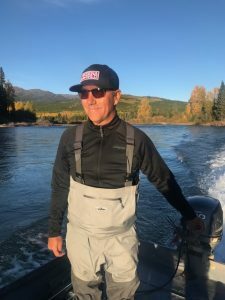 Winston Rod Company and Bauer Fly Reels are pleased to announce that Chris Seipio, of the CPO Agency, has joined the teams as Western Canada Sales Representative. Chris has been fishing for 35 years and fly-fishing for 32. He has excellent fly casting skills, winning a Canadian championship for distance casting, then going on to obtain his Masters Certification through the Federation of Fly Fishers. He has operated a successful guide company that encompassed both freshwater and saltwater fisheries. Instructing clients on both fly and conventional gear, he came to understand the diverse fishery very well and has the open mindedness to still keep learning. Born in Toronto, Ontario, Chris left for the West Coast of Canada at age 29. Chris worked in retail for years, and then became manager and buyer for a very successful retail operation. An opportunity then became available and Chris became National Sales Manager, managing other reps and all the major accounts in Canada for a major clothing line from Europe. His responsibilities included managing sales and reps as well as product direction, merchandising, product knowledge training and inventory forecasting with over 250 accounts. From that experience he brings strong skills in sales, marketing, promotions, merchandising, sales training, buying and management to the CPO Agency. For more information please contact Winston at 406-684-5674 or [email protected].